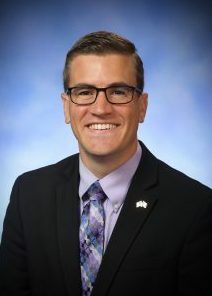 (LANSING) – Residents of the 59th Michigan House District will have the chance to meet with their man in Lansing. State Representative Aaron Miller of Sturgis will be holding in district office hours on Monday February 18. Miller will be at Rachel's in White Pigeon from 6 to 7:30 AM. From there, he will be at Yoder's Country Market in Centreville from 8 until 9:30 AM. Next, Miller will travel to Three Rivers and be at L.A.'s Coffee Cafe from 10 to 11 AM. Miller will then head to Marcellus and from 12 to 1:30 PM will meet with citizens at the Marcellus Township Library. Miller says sitting down with residents of our community on a regular basis helps him effectively represent them in Lansing. He says remaining open and accessible to the people he serves is a responsibility he takes seriously. No appointments are necessary for these in district office hours.